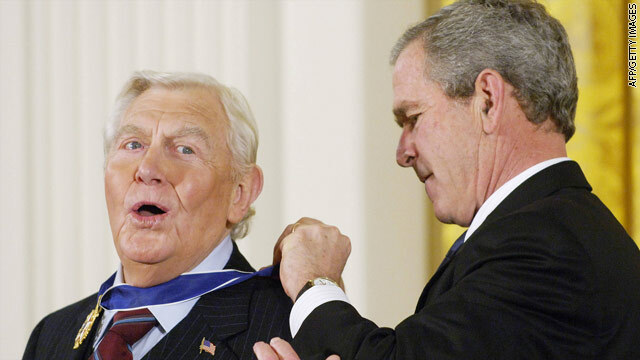 Actor Andy Griffith is awarded the Presidential Medal of Freedom in a White House ceremony November 2005. President Obama and First Lady Michelle Obama released a statement on the death of actor Andy Griffith, calling him "extraordinary talent" and "revered". "Michelle and I were saddened to hear about the passing of Andy Griffith this morning. A performer of extraordinary talent, Andy was beloved by generations of fans and revered by entertainers who followed in his footsteps. He brought us characters from Sheriff Andy Taylor to Ben Matlock, and in the process, warmed the hearts of Americans everywhere. Our thoughts and prayers are with Andy’s family." Then-president George W. Bush awarded Griffith the Presidential Medal of Freedom, the nation's highest civil award, in a ceremony at the White House in November 2005 for being an"American icon of the stage, cinema, and television." Griffith died at his home in North Carolina on Tuesday morning. He was 86. 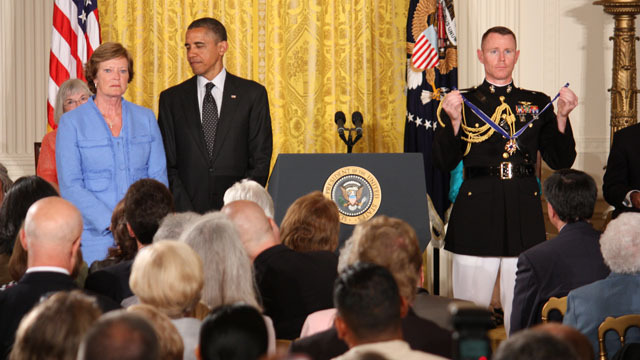 President Obama presenting the Citizens Medal of Freedom - the nation's second highest civilian honor - in the East Room of the White House in October 2011. 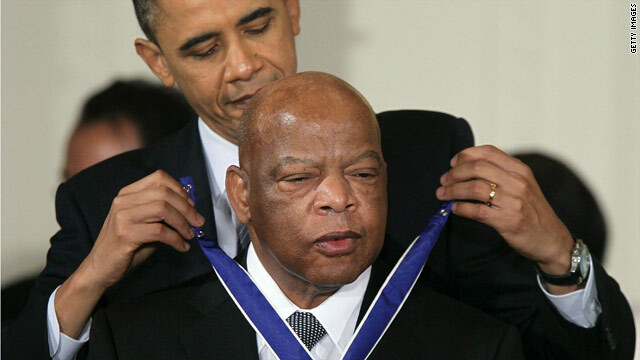 The White House announced 13 recipients of the Presidential Medal of Freedom on Thursday. Along with previously announced recipients Madeleine Albright and Pat Summitt, the recipients or their representatives will be invited to the White House in late spring to receive the nation’s highest civilian honor. Three of this year's recipients will be awarded the medal posthumously. (CNN) – Speaking at the United States Holocaust Museum, President Obama announced on Monday he will award a posthumous Presidential Medal of Freedom to Jan Karski, the former Polish officer who escaped Nazi imprisonment and provided first-hand accounts to the Western Allies of atrocities he witnessed in Warsaw. “We must tell our children about how this evil was allowed to happen—because so many people succumbed to their darkest instincts; because so many others stood silent. But let us also tell our children about the Righteous Among the Nations. Among them was Jan Karski—a young Polish Catholic—who witnessed Jews being put on cattle cars, who saw the killings, and who told the truth, all the way to President Roosevelt himself,” Obama said in remarks observing Holocaust Remembrance day. 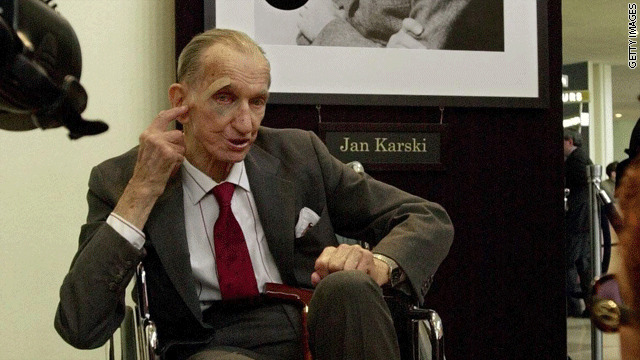 Karski, who later immigrated to the United States and earned a Ph.D from Georgetown University, died in 2000. 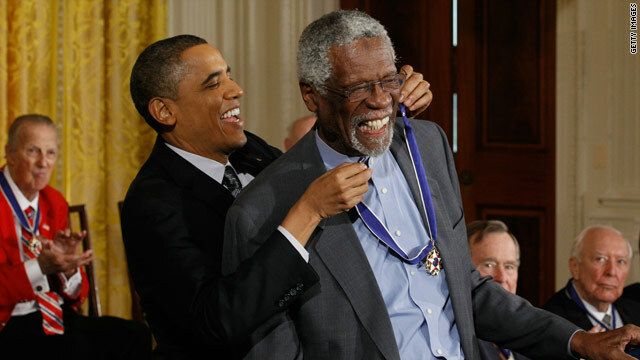 The Medal of Freedom is the highest honor a president can bestow on a civilian and is awarded to individuals “who have made especially meritorious contributions to the security or national interests of the United States, to world peace, or to cultural or other significant public or private endeavors,” according to the White House. WASHINGTON (CNN) – Today the president awarded 15 people the Presidential Medal of Freedom for their contributions to society. 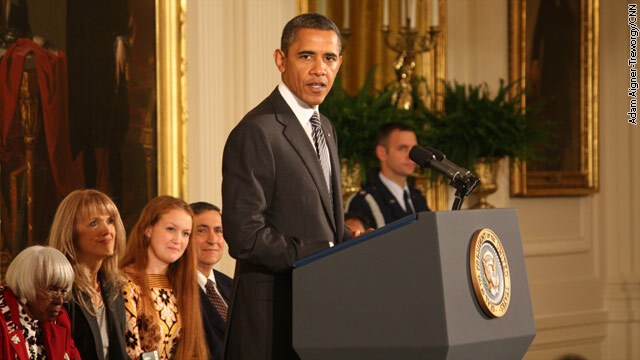 In a ceremony in the East Room of the White House, President Obama said that this is one of the events, as he described it, he most looks forward to each year. Maybe that’s because the Presenter-in-Chief gets to try his hand at humor. No more than a few seconds into his remarks, Obama had the crowd laughing when he welcomed the audience and guests to the White House. “Some of you have been here before,” he deadpanned, no more than a few feet from award winner and former president George H.W. Bush. According to the White House-provided transcript of the event, the president earned just about two dozen laughs in the nearly hour-long event. “Now you can see why I love this day,” the president exclaimed at the event’s conclusion. Nearly 50 years later, the man who was at times left for dead was seated along-side athletes, musicians, poets, and even a former president. Today he was one of just 15 to be honored by the President of the United States. WASHINGTON (CNN) - A former U.S. president, along with legendary names from the worlds of business, literature, sports, civil rights, labor rights and politics were at the White House on Tuesday as President Obama awarded the Presidential Medal of Freedom to fifteen people. The medal, the nation's highest civilian honor, is presented to individuals who have made especially meritorius contributions to the security, or national interests of the United States, to world peace, or to cultural or other significant public or private endeavours according to the White House. Check out this photo gallery from Senior Supervising Producer Stacia Deshishku of all of this year's recipients. 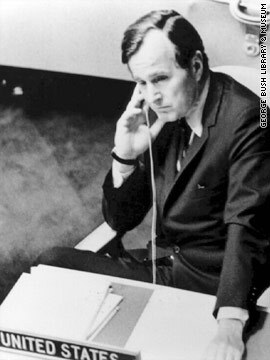 Washington (CNN) - Former President George H.W. Bush is one of 15 individuals who will receive America's highest civilian honor early next year, the White House announced Wednesday. Bush will receive the Presidential Medal of Freedom, which is "presented to individuals who have made especially meritorious contributions to the security or national interests of the United States, to world peace, or to cultural or other significant public or private endeavors," according to a White House statement. To find out who else will be honored, check out the complete story on CNN.com.